Not the character in Victor Hugo’s novel Les Miserables — the Jean Valjean that I have most often seen on stage, actor Colm Wilkinson. 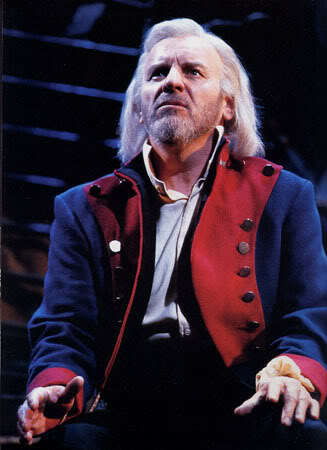 Colm originated the role of Jean Valjean in London’s West End and again on Broadway. When the show transferred to New York City in 1987, Actors’ Equity wouldn’t allow Wilkinson to play the role because he wasn’t American. So producer Cameron Mackintosh refused to open the show. Luckily for all of us, Actors’ Equity quickly changed their minds. Les Mis is one of the reasons I love Broadway today. I’ve seen the show an unprecedented 13 times, most recently a couple of years ago at an anniversary performance here in New York City. I could hear Colm Wilkinson singing. This entry was posted in Books, Broadway, Celebrities, Commentary, Entertainment, Life, Music, Travel and tagged Actors' Equity, books, Bring Him Home, Broadway, Broadway producer, Broadway theatre, Cameron Mackintosh, celebrities, Colm Wilkinson, commentary, entertainment, happy birthday, Jean Valjean, Les Miserables, life, London, London's West End, Music, New York City, stage production, Victor Hugo. Bookmark the permalink.